Drew Bledsoe was officially the last TTM autograph I received in 1995, until I started collecting again in 2010- a period of some 15 years. The overall #1 pick of the 1993 draft, and first choice of then coach Bill Parcells, Bledsoe was a consummate professional and an avid student of the game, with a cannon for an arm. Bledsoe would start immediately, being thrown right into the fire by the Patriots but responded respectably, winning 5 games his rookie season. It didn’t take Bledsoe long, as in 1994 the team qualified for the playoffs for the first time since 1986. He’d be named to the Pro Bowl and set the NFL record for most pass attempts in a season with a monstrous 691 attempts. Drew led the team to the Super Bowl in 1997 against the Green Bay Packers and was named the starter for the ProBowl. His consistency continued, leading his team to numerous playoff appearances and Pro Bowl nominations, but things changed in 2001, when Bledsoe was hit by Jets linebacker Mo Lewis. The catastrophic injury caused internal bleeding, and Tom Brady replaced Drew in the lineup. Tom never looked back, leading the team to a SuperBowl victory. Bledsoe was a consummate professional about the whole thing, and never complained about losing his starting job. After discussions with management about what he wanted- Bledsoe was traded to in-division rival Buffalo and played there admirably for 3 seasons, setting the team record for most passing yards in a game. In 2005, Bledsoe signed as a free agent with the Dallas Cowboys, and was reunited with his former head coach Bill Parcells. He’d play well there for an additional season, but by this point his mobility had disintegrated to such a point that he was getting brutalized in the pocket. Additional erratic play emerged and in 2006 he was replaced in the lineup by Tony Romo. He’d retire after that season. Bledsoe’s statistical legacy in the NFL is impressive. He’d finish at that time 5th in career attempts and completions, and 7th in yards. Drew since retirement has been active in his community, charitable events and has returned to his college roots in the Walla Walla area, where he owns a small vineyard, (Flying B Vineyards). Barry Minter is a great story about a ‘diamond in the rough’. Drafted out of Tulsa in the 6th round by the Dallas Cowboys in the 1993 draft, I think that most people didn’t hold out much luck for him making the stacked Dallas roster. When he was walking to the field one day I and asked him for his autograph he stopped and smiled widely as it was the first time he had seen the card. 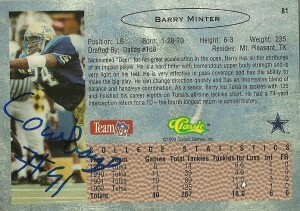 Barry was unsure how to sign it, since it was his college card so he told me that he’d put his Cowboys # on the back. A real cool cat, Josh and I wished him luck for the upcoming season. He got traded within 2 months as part of a player swap deal with the Chicago Bears. The Cowboys got disgruntled linebacker John Roper, tight end Kelly Blackwell and Markus Paul. The Bears got Vinson Smith, Minter and some draft choices. Looking back at it, the Bears definitely got the better end of this deal. Minter performed respectably well for the Bears playing through 2000 for the team recording a career high 6 sacks in 1997 and 96 tackles in 1999. During the second game of the 2000 season, he’d be injured and replaced by Brian Urlacher. In 2001 Barry signed with Cleveland playing in one game and retiring after that. 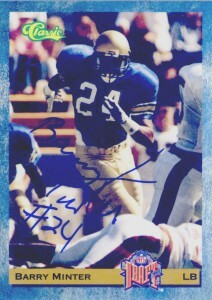 Barry’s strength was his ability to play virtually any position in the linebacking corps as he played both MLB and RLB frequently. I got Patrick’s autograph his rookie season with the Raiders when he was drafted by the then Los Angeles Raiders as a Junior in the first round of the 1993 Draft. A member of Texas A&M with Kevin Smith and the “Wrecking Crew”, Bates was a hard hitting specimen coming out of college and from the #1 college defense. In his first season Patrick was not allowed to start, (something that would get his ire) but would post an interception and 16 tackles. 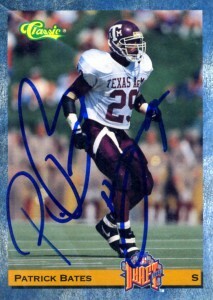 The coaches then kept playing with the lineup in 1994 when he started 9 games, recovering 2 fumbles and made 53 tackles. Bates was miserable however, (claiming it was because of he was unsatisfied with first contract, and how things were done in the organization,) and quit after the 1995 preseason, sitting out the entire season. It was reported the Cowboys and Falcons really wanted him, and so during the 1996 draft, the Raiders traded Bates to the Atlanta Falcons. He’d last one season there before a bizarre incident where he was charged with assaulting his pregnant girlfriend, kidnapping his child, and pistol whipping the mother of the baby, got him cut by the team. Afterwards he tried a comeback in 1998 with of all teams – the Raiders, but it was short lived as he failed the physical because of a fractured dislocation of the elbow. Patrick did have a difficult life, losing both his parents and his grandmother and a brother before he was 21, but he tried to own up to it, and was thankful for his foster family who raised him. He got homesick after he lost his grandmother and transferred from UCLA to Texas A&M to be closer to his family. Unfortunately Patrick Bates goes down as another in a long line of drafting disasters by the Silver and Black organization and harshly in 2008 was ranked # 37 on ESPN’s greatest draft busts. At last glance, in 2006 he was living in the Houston area and was a fan of the Houston Texans, approving of the team’s signing of Gary Kubiak as head coach- however at this time where he is remains to be seen. As a fan I really wish for Patrick’s well being and the best.